Thirteen Years | Kris Johnson's Blog…sort of. 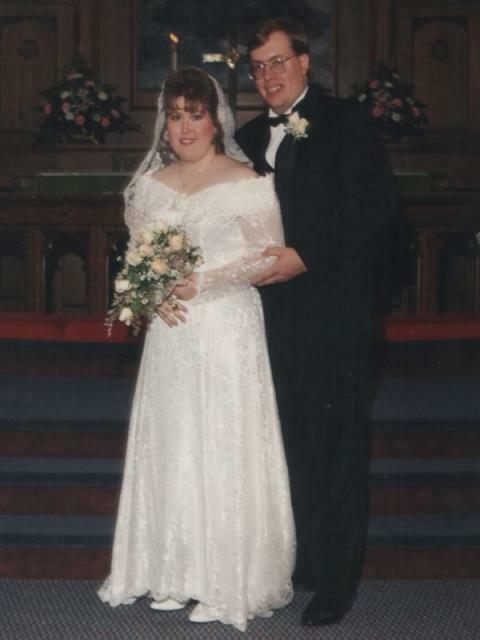 Today is the thirteenth anniversary of the lovely day in October of 1996 when Ms. Laura Sperry became Mrs. Laura Johnson. Some of you were there and may remember the very day, perhaps even better than I do. To me, the day was a whirlwind of activity and I remember only bits and pieces; all of them good. So how have the last thirteen years treated us? Well, we’ve had our ups and downs, but I think Laura would agree when I say there have definitely been more of the former than the latter. In 1996, Laura was driving a 1994 Pontiac Sunbird. The little blue car left our driveway for the last time just this spring. Laura now drives a 2000 Pontiac Montana and I drive the MiniVan…of DOOM! (A 2002 Pontiac Montana, as it happens.) We also had an Oldsmobile Alero for three years, a car I believe Laura misses to this day. In 1996, we lived in Fairport Harbor, Ohio (my second apartment in that little town). Shortly after we got married, we moved to Mayfield Heights, Ohio, where we lived until 2001; then we established the International House of Johnson in Willoughby (yes, Ohio). In 1996, Laura was an assistant managing editor and I a computer sales associate. Our roles have changed to stay-at-home mom and systems engineer, respectively. In 1996, it was just the two of us in what amounted to a studio apartment. The first addition to our family was Sushi, an angry betta, shortly followed by Rosencrantz and Guildenstern, two cats whose IQs have been steadily declining since 2003. Sushi lasted about two years before a combination of impotent rage and oppressive ennui caused his little piscean heart to burst. In 2006, we were joined by Kyle, who I often refer to as “my young apprentice”. We weren’t exactly expecting Kyle; in fact, we didn’t find out he was on the way until he had been simmering for about four and a half months. He arrived on Friday, January 13th and I daresay nothing has been the same since. Since 1996, Laura and I have attended a couple of high school reunions, umpteen weddings, and an unfortunate number of funerals. We’ve celebrated births, birthdays, anniversaries, and holidays. We’ve taken two Caribbean cruises. We’ve traveled to Texas, Nevada, North Carolina, Florida, Pennsylvania, New York and Illinois together. We’ve driven (or flown) back and forth to Upper Michigan at least once and sometimes two or three times a year. The police have been dispatched to our house three times; the fire department once. The only casualty related to any of those visits was our mailbox. There are certainly things I would change about the last thirteen years—times when the phrase “wedded bliss” didn’t always apply—but I wouldn’t change the October day that started it all, when we had no idea what the future would hold and knew only that we wanted to spend it together. I’ve seen part of that future; I’m looking forward to the rest. I remember the day, how your uncle brought the mini-cannons for the 21 gun salute, only to blow up the bride’s sister’s car. it was quite the occasion. Thank heavens, Kris, that you talked to the doctor about that rash, else Laura might have run screaming into the night. Congrats, you crazy kids. You should shake it up a bit tonight…try switching the couches you sit in to watch T.V. Variety, they say, keeps a marriage alive. @Chris — My first draft of this post actually had a bit about how we used to have our “assigned” sides of the couch, but the system has been thrown into turmoil thanks to the introduction of Laura’s laptop (it’s complicated). Good luck with your bunion rubbing. I should point out that a similar (and complicated) set of affairs involving Laura’s laptop (hopefully not YOUR Laura’s laptop, else MY Laura has some ‘splainin’ to do) has our own couch assignments in turmoil as well. Oh, and hearty congratulations! And mazel tov, as I am currently at my place of Jewish community-owned employ. @Cmaaarrr — I believe the appropriate response (despite me not being in a place of Jewish community-owned employ) may be “toda raba”. As to couch-position flux, I exaggerated the complexity a little. It really has more to do with the convenience of outlets near one end of the couch and the more ideal television-viewing at the other. I’m fairly certain your Laura’s laptop is not involved; that most certainly would complicate things. As you work on your writing, this post should be looked at as an excellent example. @Eric — You are entirely too kind. Thank you very much. Congrats! I didn’t realize you had cops and fire trucks at your house on multiple occasions. My curiosity has been piqued. A couple of summers ago, some kids joyriding in a pickup truck hit our mailbox. A neighbor saw them and called the police, who stopped by to get a statement. The third time they showed up was late at night, after getting reports that someone was skulking around in people’s backyards. Yeah, that was me, “skulking” to find out whether there was a water main leak in my backyard or whether the water was also out at our neighbor’s house. I was so intent on skulking that I knocked on their patio door, then left after no one answered. The fire department came this summer after I called the non-emergency number because something reeked of fuel oil. It was actually night paving being done a few miles south of us; the oily hot asphalt odor was drifting north thanks to some strong winds. @Nycteris — Thanks! Everyone at the International House of Johnson is happy to have met you, as well. My brother is a skulker. I had to call 911 once at work when I thought the homeless guy in our alley was dead. He wasn’t though, but his “neighbors” robbed as much as they could off him before the police came.